When I was a kid, with the exception of Spaghetti night, we’d usually have a piece of meat (or possibly fish), a starch, and some peas, if I remember correctly. Or corn. The food was fanned out horizontally on a plate, and this is a template that worked, and still works, for most families, most nights. It’s a very American way of eating. In contrast with that style of eating is what I’m going to call “Pile.” Pile is the word my friend Nicole uses for what she and her husband cook for dinner almost every night. We eat it in a heck of a lot of forms around here, too. Nicole and I believe that there should be an arrow at the end of it, to indicate the upward trajectory so key to eating a pile of food in a bowl. So, the definition of pile is: grain or noodle, possibly legumes or another protein; savory roots like onion, garlic, or ginger; agents like perhaps strong greens like kale or collards; accent vegetables, and perhaps salad greens, and condiments. Pile is never soup. These things are layered and mixed up and eaten from a bowl with a fork or chopsticks. Nicole and Josh are mostly vegetarians, though the example you see above came from their kitchen, and it has breaded and fried tilapia on top! 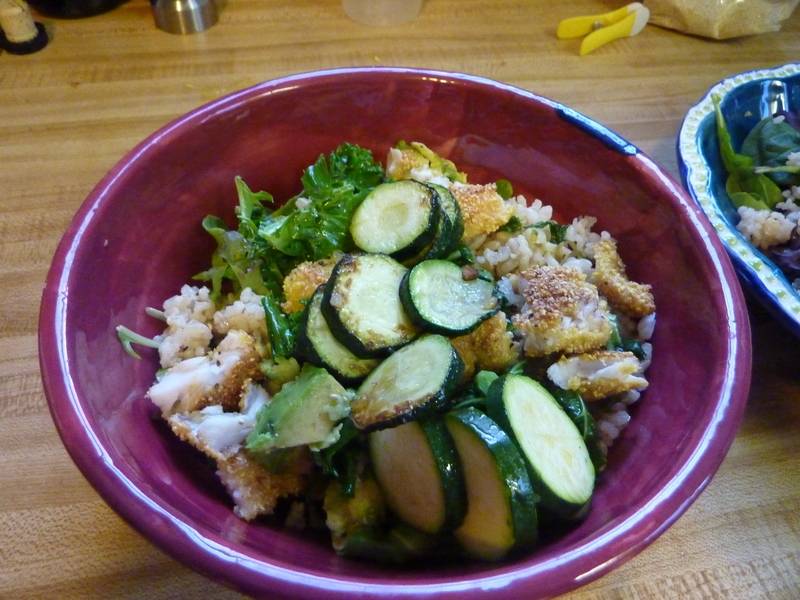 When you want to cut out meat or fish, or use a substitute, or just use less, PILE is a wonderful way of eating. It’s also good because it is DELICIOUS, and very flexible, and messy, and can be fast. I also really enjoy eating out of bowls, and I love condiments, and sauces, and herbs, and the chance to squeeze limes on things, and all of these things work well together. We really love pile over here. For a while now, I’ve been meaning to post on different sorts of pile. However, talking about 5 different recipes in one post is overwhelming, and I suddenly realized that making it a series would help me jump right in. So: coming next: a recipe for the most standard pile we make. After that: peanut butter pile, and ThaiPile, and more. Also: feel free to email or comment with tales of, or recipes for, your own pile recipes! I would love to hear them / post them. Read about Choose Your Own Adventure Peanut Butter Pile. Read about Colon Blow — if you dare! ← Where Is the Fishdinner. i don’t understand why it’s called PILE. I want it to be an acronym and it’s not. I’m not concerned with the name as much as with the difficulty of getting Italian husband to eat something with so many distinct ingredients. Sad. Love PILE[where the heck is the upward arrow symbol?] style meals, and am excited for future recipes! Good eating style, but every time I read the name, I wonder what “piles” are and think they are something unpleasant. Oh, and I just googled it and it is hemorrhoids!